At the moment Nvidia GPU miners have the advantage for mining X11-Gost with a faster hashrate for the more recent Maxwell and Pascal GPUs than AMD miners. Still AMD miners might be interested in checking out the X11-Gost algorithm used by SIBCoin (SIB) as it is not that power hungry and with the increased interest with the recent addition of the algorithm on NiceHash as it might offer a nice profitability for users willing to sell their hashrate and get paid in Bitcoins directly. So if you are using AMD GPU mining rigs you might want to check out X11-Gost on NiceHash using the latest sgminer 5.6.0 Nicehash Fork (source). 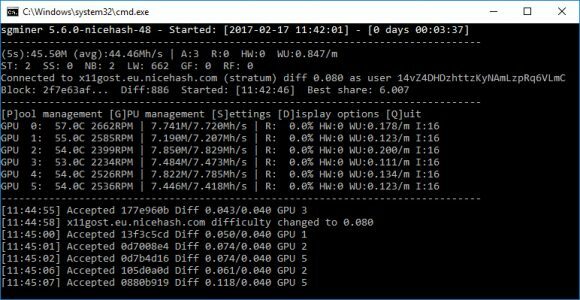 We are seeing a hasrate of between 7 MH/s and 8 MH/s on stock Radeon RX 480 and while still slower than about 11 MH/s on a stock Nvidia GTX 1070 the fact that the algorithm is not that power demanding and you can use lower power for the GPUs may make it attractive for some users, so do give it a try. Older generation of AMD GPUs may not be the best choice for this algorithm performance wise and the same pretty much goes for older Nvidia GPUs, but for AMD Polaris and Nvidia Maxwell and Pascal it is.